Just got this email from the “Blue Wizard / Black Wizard” team and think it is really interesting. Then we started talking, and it seemed strange to us that when making budgets for small theater shows, common wisdom is not to rely on ticket sales. For most businesses, of course, the primary way (if not the only way) to meet your costs and make money is to simply sell your product. And yet we in the theater (and other arts) rely disproportionately on donors, grants, angels, in-kind gestures, etc, and then fill our houses with comps, papering, discount codes, etc. With the budget in mind, and a 14-show run in a 70-seat house, we would need to sell out every show and set tickets at $36. $36. That’s what our product is at cost. So, we are asking you to pay for a full-priced, at-cost ticket in advance. We’re asking you to buy the product at the rate it costs us to make it. The “perks” are simply the number of tickets you are buying: you get 2 tickets with a $72 donation, 3 for $108, 4 for $144, etc (if you’d like to buy more than 4 tickets, just put yourself down for at least the proper multiple of 36 and let us know in a comment). We’ll follow up with an email so you can reserve the date you want. To thank you for showing your support at the full ticket amount, we’ve decided to make this the only way to secure a seat in advance. But, we understand that many audience members are fellow artists and students with tight budgets, so once we open we will also be selling discounted rush tickets at the door, for every performance. And if you’d like to give more, you are most welcome to! Giving more will underwrite the rush ticket sales for people who can’t pay the full $36, allowing us to cover our costs while still keeping the show accessible to all. Or if you are out of town and would like to give, think of your contribution as buying tickets for some struggling artists or students. We and they would be most grateful, and there are producer credit perks at the higher levels. We’ve set the funding goal at $15,000, which is the bare minimum we need to raise to avoid going into serious debt. The closer to $36,000 we get the better, but we’ll make a show no matter what we raise in advance. If we do reach our budget in presales, then the 13 members of our amazing all-singing/all-dancing/all-volunteer CORE ensemble will get stipends, and Mimi and Oana will be able to make beautiful, stunning things, and Yi and Mike D will do all sorts of technical trickery, and we can fly Andy, our trombone player, in from Oakland, and Dan can have all the glitter he wants. 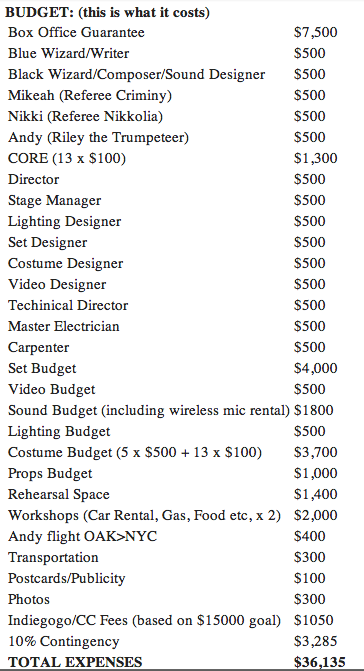 And if we do all that, then maybe even Dave and Eliza (the co-creators) will take their modest $500 fee too, to put in the piggy bank for the next show down the road.